Go to your district/SU VCAT site by typing yourdistrictorSUname.vcat.us (e.g. cesu.vcat.us) in the address bar of your web browser. 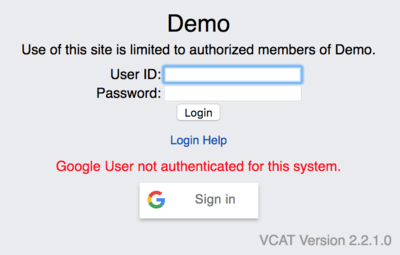 In order for a staff to gain access to VCAT using the Google Sign-In feature, the email address associated with the staff account in VCAT must be the same as the one used for the Google account. Click on G Sign in to log in VCAT using your Google account. 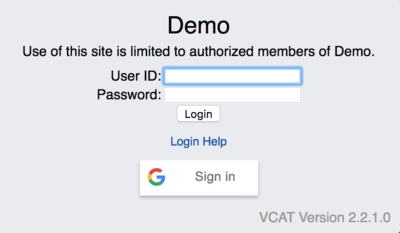 If you're already signed in Google with the account using the same email as the one entered in VCAT, you will automatically be logged in VCAT. Google Sign-In supports all major browsers. You must be signed into Google on the browser you are using. If you click on G Sign in and your email in VCAT isn't the same as the one associated with the Google account you're logged in with, you will get a message in red that reads: Google User not authenticated for this system. If you click on G Sign In and you're not already signed in your Google account, the system will bring you to Google and allow you to sign in. Once you're signed in Google using the same email address as the one entered in VCAT, you'll automatically be logged in VCAT as well. It is essential that you log out when you are done using VCAT to ensure that no one else gets access to VCAT via your computer. To log out, simply click on the Logout blue link located on the top left, under your name and Password link. NOTE: VCAT will TIME OUT after an extended period of inactivity. This page was last modified on 5 September 2018, at 13:19.